Basic helmet design has come a long way since... wait, no it hasn't. Sure, Snell ratings and DOT approved helmets change every few years as our understanding of head trauma increases, but the basic skull bucket remains pretty much the same as it has for decades. Voztec is looking to add a bit of innovation into the industry, and it's rear access system looks quite interesting. By way of a rear access door, the rider/driver puts their head into the lid and the door clamps shut behind them. In case of an emergency, the helmet can be lifted away from the person's face without having to move the injured person and risk further injury. Voztec is working on rear access helmets for motorsports, horseback riding, snow sports, firefighters and the military. It's even penned a concept design for an NFL version of the rear access helmet. This helmet is the fifth prototype that Voztec has developed, and it's now currently undergoing testing by a third party. 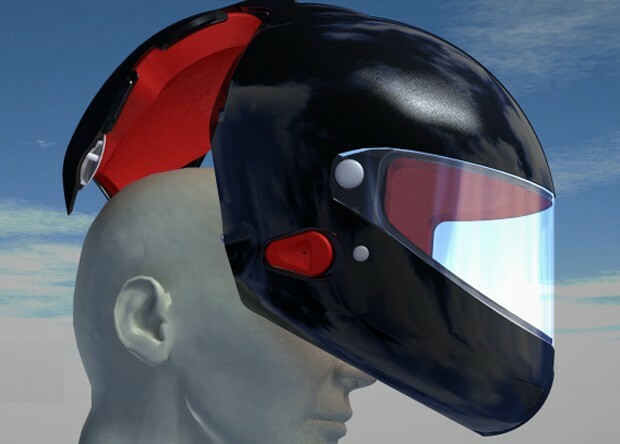 Also, Voztec is looking for investors to help bring its rear access helmet to market, and we hope someone ponies up the dough because we'd love to get a closer look at this unique concept.